The U.S. Geological Survey says a moderate magnitude 5.3 earthquake has rumbled through southeast Idaho, just 60 miles south of Yellowstone National Park. 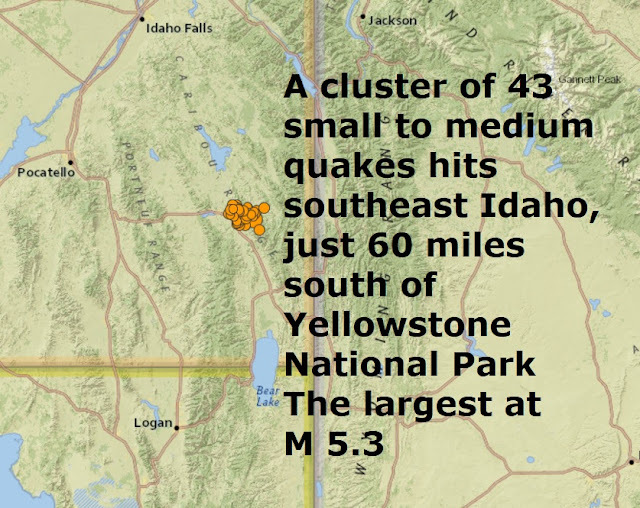 The epicenter of the quake was located 11 miles east of Soda Springs, Idaho, and was also felt in Wyoming, and across northern Utah in Logan, Ogden, Salt Lake City, Draper and Provo. The USGS reported four separate quakes Saturday evening in an area about 63 miles from Pocatello and 130 miles from Salt Lake City. The agency says only slight damage occurs with earthquakes at that level of intensity.